MOCAP High Temperature Vinyl Plastic Masking Caps are the low cost quality answer to your masking needs. Flexible material allows these plastic caps to seal round and odd shape items. Special high temperature resistant vinyl material withstands up to 475°F (246°C). 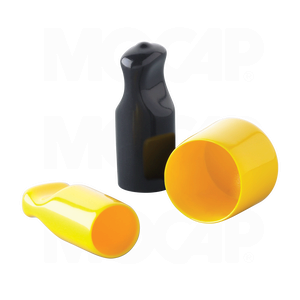 High temperature resistant pull tab caps are designed for easier application and removal. High temp pull tab caps are available in sizes to fit 0.187" to 1.125" diameter applications. High-temperature resistant round masking caps are also available in sizes to fit 0.062" to 6" diameter parts.